The first ever Infiniti Q30 Active Compact is to launch at this year's Frankfurt International Motor show. A fortnight before the launch, images have been released showing the luxurious and high quality cabin of the Japanese vehicle. A modern ambiance is created by quality materials, such as the Dinamica suede-like material from Italy, which is more commonly found in the high-fashion industry. 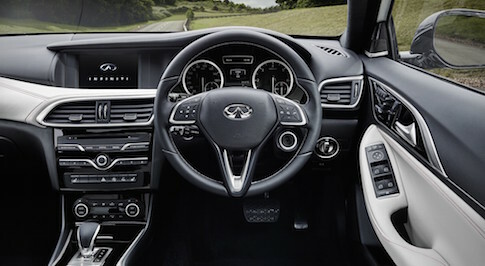 The cabin, which boasts enhanced comfort and support driver and passenger seating compliments the uniquely expressive exterior of the new Q30. As the newest premium compact in the segment, the new Q30 boasts sharp dynamics regardless of whether it is on country roads or city streets. President of Infiniti, Roland Krueger commented: "The Q30's sculpted exterior and asymmetric cabin design are unmistakably Infiniti. With the Q30, we are entering a new segment for Infiniti and broadening the offer to our customers. This vehicle is a vital part of our strategy to be a top tier global manufacturer of premium cars."